With a focus on organic, local ingredients and healthy meals, Cafe 901 on Jeju is a rare find in that it is completely vegan. While you can find restaurants focused on traditional plant-based and Buddhist inspired cuisine as well as vegan options at small cafes, an entire cafe with just vegan food on the menu is a novelty around here. It is also very focused on healthy meals, with several raw food options on the menu, freshly pressed juice, and even raw desserts and baked goods - some of them gluten-free. They mostly advertise with the 'detox food' as their main focus, so before visiting, I wasn't actually sure if the cafe would offer all that many vegan options - but turns out, detox food meant plant-based. 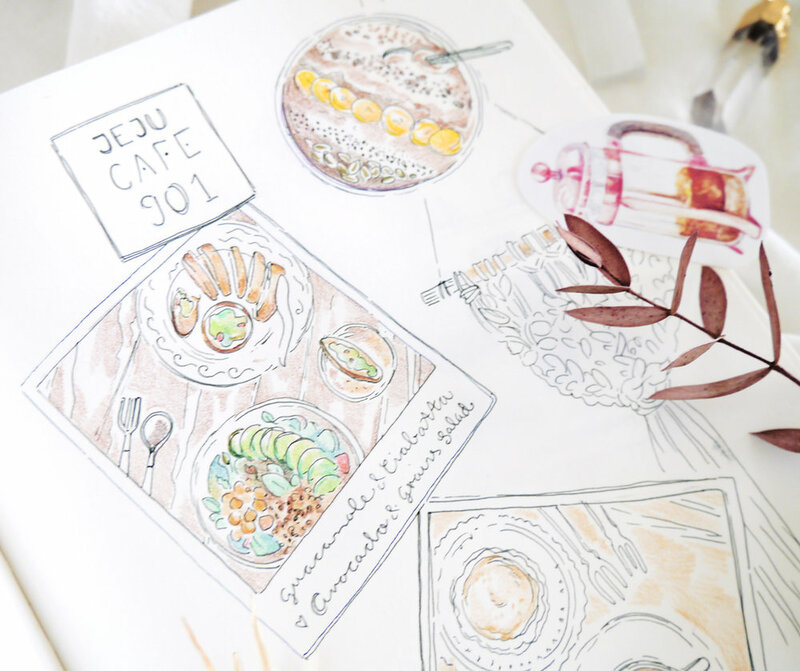 If you're traveling to South Korea as a Vegan or Vegetarian (and if you're dairy intolerant and craving bread or dessert...) and plan on visiting Jeju Island, let me introduce you to this little cafe near Jeju City! Cafe901 is part of a small health resort building that also includes an exercise/physiotherapy center and a guesthouse called Stay901. The whole area here seems built on small, health-focused businesses and there's even another cafe with a nature & flower theme just across from Cafe901. You have to climb up one flight of stairs to reach the cafe, which has a view of Hallasan. One more stair will give you access to the rooftop terrasse (I opted out because it was an extremely windy day...) and I can imagine how that would be a lovely option once it gets warmer! The interior is a mixture of styles, with old-fashioned furniture, vintage elements, concrete walls, lots of natural light and plants everywhere. Again, Cafe901 advertises by focusing on 'Detox' food, from smoothies to teas and juices. Since I eat mostly whole-foods plant-based and am 100% vegan anyway, I'm not really a fan of the whole 'detox' idea in general - but if it means I get a whole menu of vegan food, drinks, and even raw desserts? Sign me up! After a long morning of running errands and having skipped both breakfast and dinner for a blood test, I was ready to dig in and we decided to order a wide variety of food. Soymisu - a vegan tiramisu option! Cafe901 also adds seasonal juices and smoothies - I've seen a Jeju Cactus flavored drink pop up on their blog and a mango smoothie on their Instagram. All in all, they are very active on social media and I'd recommend following them for updates if you plan on traveling around Jeju. I really like the DIY feel to most of the interior of Cafe901, especially the hanging plant and light contraptions! Waiting for food - the perfect time for sketching and playing around! Here's what we ordered at Cafe901! Avocados are so expensive in Korea and don't even show up in any supermarket close to where I live, so I like to indulge when I find them on a restaurant menu. You can see all the green here. Avocado power! The avocado grain salad bowl came with chickpeas, beets, a refreshing vinaigrette dressing, and quinoa. Quinoa is another thing that I don't buy since the prices are so high, so it was a nice change from my usual grains. The ciabatta bread was even better than the guacamole itself! As in, I came for the guacamole (and no mistake, it was delicious!) but stayed for the bread. The ciabatta bread was so crisp and at the same time moist and fluffy on the inside. Often, ciabatta can turn out super dry, but this one was luxurious and flaky! We got an extra slice and I couldn't stop eating! Since it was our day off, we took our time. Going to a beautiful cafe and eating delicious food can be a mini vacation in itself, so I like drawing some travel sketches to relax. This raw & organic cacao Deodeok smoothie bowl came with all the hoped-for toppings and more! But the special ingredient hid inside the smoothie itself: Deodeok. Codonopsis lanceolata isn't well known outside of Korea, but here, the root is used in a variety of traditional side-dishes as well as in Korean traditional medicine - similar in effect as ginseng, but less intense. I'll be writing more in-depth about the different kinds of roots used in Korean cuisine (and medicine) but let me just say that Deodeok is one of my favorites! It has that typical "Hanyak" smell you might recognize if you've ever tried Ginseng products, but it's much more toned-down. The texture - if it's used in its entirety - is very interesting. Not fibreous, not crunchy... the best way I can describe it: My husband once flattened and tenderized the peeled roots with a mallet, then grilled them with a spicy marinade. The finished dish was SO SIMILAR to grilled fish fillets my vegan heart got extremely confused. In this smoothie bowl, Deodeok was present in powder form. Together with the cocoa and banana sweetness, it added just a hint of a unique aftertaste and depth. I love finding baked goods in Korea that don't include milk or butter. Even toast bread here usually comes with one non-vegan ingredient minimum, so I bake all my bread myself. If you're a vegan living in Seoul, you're in luck: There's a ton of vegan-friendly cafes and bakeries, with new ones opening all the time! There were four different muffins available at Cafe901. Since I bake quite a lot at home, I wasn't too excited because they were small compared to my own concoctions. A testament to the whole "Detox" theme maybe - and to how the vast majority of Koreans I've encountered think Veganism is only about weight-loss. Read more about my general advice for traveling to Korea as a Vegan (or Vegetarian) here! My husband wanted to try the rice flour muffin here at Cafe901 and I happily complied since I never bake gluten-free and was curious about the taste and texture. If you know "Baeksolgi" rice cakes, you could compare it to those, texture-wise, though a bit less dense and heavy. The sweetness was supple and the muffin itself fluffy. It went really well with the espresso we got on the side! I sketched in my art journal as I sipped on the coffee and looked for the last muffin crumbs. If you're interested in starting your own art diary, you can get inspiration from some of my previous travel journaling posts or check out more in-depth tutorials and tips here! I adore this new class on journaling called "Draw Your Life" so that could be a creative way to get started, too. One thing I have to mention: Cafe901 has relatively small portion sizes. The smoothie bowl was about half the size of the one served at Bottle & Bowl, and the salad even smaller, comparatively. I completely understand why: The ingredients are expensive (as I mentioned, especially Avocado is a lot pricier here on Jeju than on mainland Korea) and the focus on organic, local-sourced products makes that even more pronounced, so the portion sizes for the price have to be smaller. Just wanted to give you a heads-up if you're a hungry traveler looking to refuel after a day of sight-seeing or hiking! 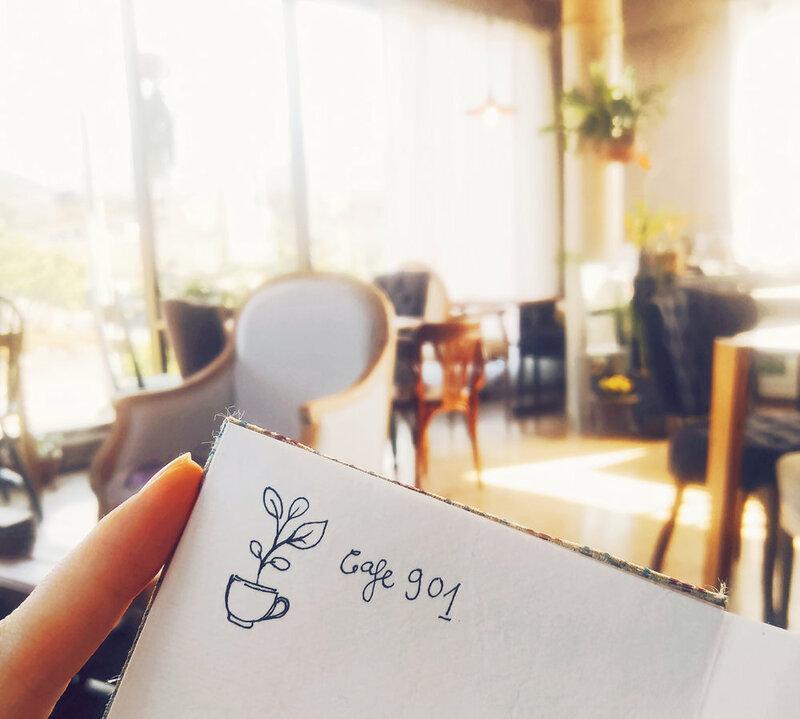 The peaceful atmosphere, unique combinations of local ingredients like Deodeok and "western" vegan food, the gluten-free and raw options... all in all, Cafe901 on Jeju Island is a wonderful place to treat yourself, relax, and recharge! Find the Happy Cow reviews for Cafe901 here!